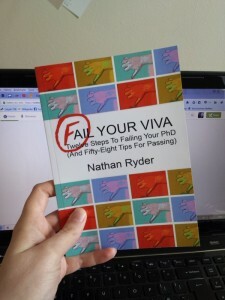 First up, a print copy of Fail Your Viva, my first book on viva preparation. This was released as an ebook in January 2013, and has topped several Kindle charts since it was released. It’s been well reviewed and regarded for the last few years, but it’s only in the last month that it’s been available in print. Participants at the Viva Survivor workshop in Manchester on June 29th will be among the first people in the world to have a copy! While we’re on the subject of books, participants will be getting ebook copies of both Fail Your Viva and The Viva: Who? What? How? These will be in the form of codes to download copies from my Payhip store. Enter the code and you get ebooks in both .epub and .mobi file formats – which are compatible with most ebook devices, ebook apps and free desktop software. I’m really glad that I can provide these for participants – I think they’re great books, but more importantly the feedback I’ve had about them has told me that they’re really helpful. 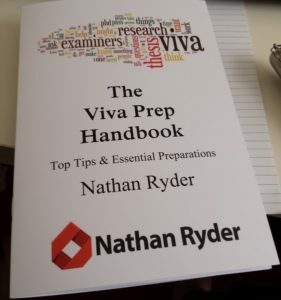 The Viva Prep Handbook is a brand new resource. I typically deliver the Viva Survivor workshop with a couple of handouts. I’ve been wondering if there was a better way to share the information in the handouts… And could I add to it as well, summarising some of the preparation tools and tips that I share in the workshop? What started as a little project to find a good way to share some details of the session has become a professionally printed booklet! Participants at the workshop will be the first people to get a copy of The Viva Prep Handbook before it goes on sale in July. It’s quite exciting that the Viva Survivor workshop has inspired something else! The paperback, ebooks and the new booklet combined would cost over £20 – participants will receive all of these, plus a pack of essential viva prep materials in their Viva Survivor goodybag! I want participants to feel like they are getting something special for coming. Finishing the PhD is special. June 29th is fast approaching. I’ve delivered Viva Survivor almost 100 times at universities all over the UK but this is the first time I’ve delivered it at an independent venue. It’s being held at a great venue in central Manchester, and participants are going to have a great workshop experience and receive an amazing goodybag of valuable viva prep materials. If you’re a PhD candidate, check out the event details, and book on before time runs out! If you have questions or want to know more, drop me an email and I’ll get back to you ASAP. Thanks for reading – feel free to share this post with anyone that you think will be interested.